A black and white negative of three of the Beecroft children sitting outside on grass. From the left - Norma M. Beecroft age 5, Eric Edmund Beecroft age 3, Eleanor Jane Beecroft age 7. In this view all three children are looking down and reading books. 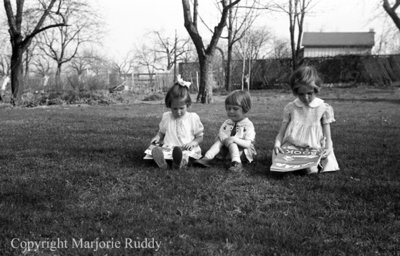 Beecroft Children, May 8, 1939, Marjorie Ruddy. Whitby Archives A2013_040_875A.